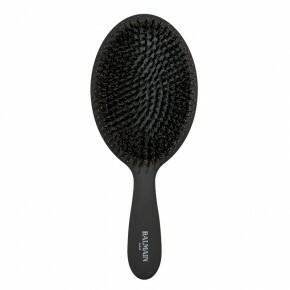 Professional Spa Brush with a blend of nylon ballpoint and 100% boar hair bristles. The unique structure of the boar hair bristles carries the hair’s natural oils from the scalp to the end of the hair shaft. By coating each strand with a very small amount of sebum, the brush repairs dry hair, reduces frizz and adds lustrous shine, while the stiff nylon ball-point bristles massage the scalp, increase the blood circulation and detangle the hair. The boar hair bristles and longer nylon ball point bristles that stimulate the scalp and help to detangle the hair while allowing the boar bristles to distribute the sebum. Regular brushing with the All Purpose Spa Brush prevents oil build-up at the scalp which makes the hair look greasy, reducing the frequency of washing. It stimulates the scalp and increases the blood flow to the hair follicles, which can improve hair growth. The black rubber cushion pad features eight rings of boar hair and stiff nylon bristles that move easily through the hair. With curved matt coated handle for better grip and a comfortable and easy hold.